Stella Artois is a quintessential premium European lager. Made with the finest European hops and traditional malted barley, Stella has a golden color and a thick, soapy head. The blend of all natural ingredients creates an excellent medium-bodied lager, simple and refreshing. 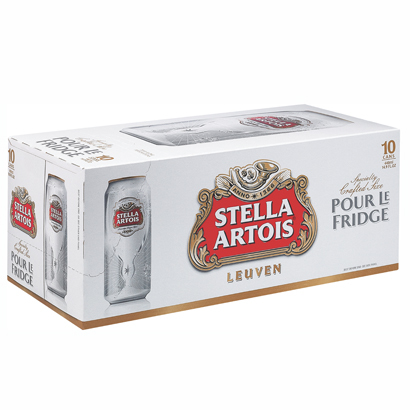 Stella Artois has a crisp, clean palate with a mildly bitter flavor for easy drinkability and a lingering finish of hops. Stella Artois originates all the way back to 1366 in Belgium when the Artois Brewery created a special holiday brew known as “Stella” (star), named for its exceptional clarity. Popular demand forced the brewery to produce it year-round as its flagship beer. Stella Artois’ crisp, dry character makes this beer the perfect complement for rich dishes such as lamb, lobster and shellfish. Stella won’t overwhelm the complex balance of flavors in these dishes.